Randi Zuckerberg: "People Will Be Pleasantly Surprised" About Reality Show "Start-Ups"
Okay, it's not exactly The Real World, but Start-Ups: Silicon Valley might be the closest thing Silicon Valley has to its own version. It's high time reality TV focused on tech start-ups, says Randi Zuckerberg, founder and CEO of Zuckerberg Media. (Yes, that Zuckerberg — Facebook's former head of consumer marketing and Mark's sister.) Appearing on CNBC's Squawk on the Street this week, she said, "Geeks are like rock stars now … There's such a fascination with entrepreneurship, I think especially given the economic climate of our country. So what better time to shine a light on Silicon Valley?" The setting could be perfect fodder for television. It's not hard to imagine that life inside these budding operations would be rife with drama, but just in case that's not enough to draw in viewers, the show seems to veer into the typical reality TV formula — complete with toga parties, pool-side lounging and bikinis. And this is what has some Valley insiders aghast, concerned with how the community will be portrayed. Is it really that over the top? Well, you be the judge. Here's the clip. Clearly this is reality TV, not a documentary on the struggles of the insanely competitive world of start-ups. But while Zuckerberg, the executive producer of the show, admits that the previews are a bit provocative, she insists that this won't be the predominant aspect of the show. "I think people will be pleasantly surprised with the balance of fun and technology that they see," she says. Are you excited about the upcoming debut, or does the promo have you shaking your head? Tell us what your take is in the comments below. 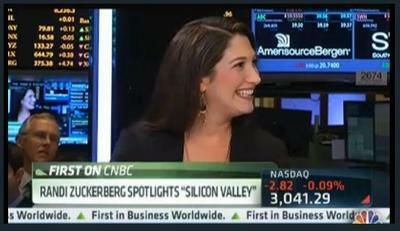 And if you're undecided, check out Zuckerberg's interview at CNBC by clicking her photo above. Start-Ups: Silicon Valley debuts on Bravo on November 5.